These Chippewa Men's 25406 USA-Made Waterproof 9 Inch Super Loggers are called super for a reason. No, they can't leap tall buildings in a single bound (we don't think), but they do have other powers made just for the challenges of rugged worksites. Take the Bay ... (see full details) (see specifications) #CHP25406. These Chippewa Men's 25406 USA-Made Waterproof 9 Inch Super Loggers are called super for a reason. No, they can't leap tall buildings in a single bound (we don't think), but they do have other powers made just for the challenges of rugged worksites. Take the Bay Apache waterproof leather uppers of these brown boots, for example. Not only do they surround your feet in soft, supple comfort, they also fight soggy, wet feet by keeping out the elements. Just to be sure this pair of men's boots is 100% waterproof, Chippewa added their signature Chip-A-Tex waterproof booties to seal the deal (well, seal the waterproof boots, rather). To tackle internal moisture, this pair is lined in Ruby Dri-Lex 2000, which wicks away perspiration for a dry, cool fit. The handsome 9-inch logger design features heavy-duty wax sta-tied laces and non-tarnishable antique brass hardware giving the USA-made boots the power to stand up to everyday jobsite beatings. Chippewa employs Goodyear leather storm Welt construction to attach the rugged uppers to the soles. Stitched rather than glued, Goodyear Welted boots are much tougher and stronger than their competitors and deliver years of dependable wear. Speaking of soles, the Vibram Tacoma Yellow Plug outsoles on these workers provide outstanding traction on a variety of terrains. They're oil- and slip-resistant, so they keep you grounded the whole day through. We know it's hard to believe, but this pair of Chippewa boots is even super in the comfort department, too. Removable and easy-cleaning waterproof orthotic insoles cushion each and every step you take for soft, dry comfort. Thanks to triple-ribbed steel shanks, you can count on improved stability and control as well. Working people deserve jobsite superpowers. Since we can't help you speed up time or give you X-ray vision, we'll just make sure you have the best men's footwear available. 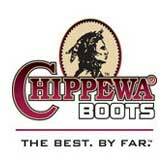 Click on the cart to order your Chippewa Men's 25406 Brown Waterproof 9 Inch Super Logger Boots today. bought this boot in march, now in October I'm looking for new boots. the sole is falling off. one and two eyelets have fallen off the left. not proving to be very rugged or reliable. After having my first pair of Chippewa's last over 10 years, It's time for my next pair. this new pair should last till my retirement! I actually have model# 25407 which isnt insulated and which workingperson quit carrying. ive worn these at least 6 days a week for work, 4 wheeling, and casual wear since sept '11. i will buy another pair of these boots or maybe the other american made loggers chippewa makes, but there are a couple negitives with this boot. they run VERY narrow, at least in steel toe. ive never tried plain toe. ive worn 13 d width in every boot and shoe for 12 years now, including the chinese made chippewa loggers. but this boot i had to go with a EEE for it to fit in the toe box. the heel cup is a little big but thicker socks helped that. the other is the soles on the sides of the boots get little splits in them and they also tend to seperate from the leather rand around the edges. not enough for the sole to fall off because its swon through, but enough to annoy you if you lookat them. but that seems to be a logger boot problem in general. ive had other brands do that too. but all in all i recommend them. Chippewa Boots: Men's Waterproof USA-Made 25406 Logger Work Boots is being added to your cart.